성주사 감로도는 화기에 의하면 1729년에 성징(性澄)을 증명과 수화승으로 맡고 신정(愼淨), 한영(漢英), 인행(印行), 세관(世冠), 국영(國暎) 등이 참여하여 그린 하단탱 불화이다. 성주사 감로도는 조선 후기의 일반적인 감로도와는 다르게 화면을 구성하고 있다. 이 그림의 화면구성은 상부에 칠여래(七如來)와 관음보살을 중앙부에는 지장보살, 인로왕보살을 비롯하여 아귀와 작법승 등 의식장면을 하부에는 역시 인간의 생활 양태와 죽음을 맞이하는 양상을 배치하였다. 이 그림의 가장 두드러진 도상적 특징은 조선 감로왕도 도상의 필수적 구비 조건이었던 시식대 즉 재단(齋檀)과 작법승의 장면이 생략되었다는 점이다. 그와 더불어 화면을 향하여 오른쪽 상부에 극락세계를 의미한 전각이 배치되고 칠여래가 매우 강조되었고 전투 장면이 육상이 아닌 해전으로 표현되었다는 점이다. 이처럼 재단이 생략된 감로왕도는 3점이 더 알려져 있는데, 그 가운데 제작시기가 가장 앞서는 직지사 구장(舊藏) 감로왕도(1724) 역시 이 그림을 그린 성징(性澄)과 세관(世冠), 인행(印行) 등에 의해서 제작되었다. 따라서 이 성주사 감로왕도는 직지사 구장본을 모본으로 하여 제작되었음을 알 수 있다. 이 그림은 조화로운 색감과 섬세한 세부묘사 등 안정된 화취를 지니고 있고, 도상적인 특이성 특히 직지사 구장본의 행방이 확실하지 않은 현재 매우 중요한 감로왕도이다. 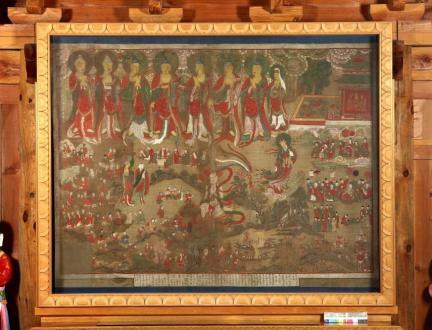 The Painting of the King of Sweet Dew of Seongjusa Temple is a Buddhist painting made in 1729 by a group of monk painters led by Seongjing, including Sinjeong, Hanyeong, Inhaeng, Segwan, and Gugyeong. The Painting of the King of Sweet Dew of Seongjusa Temple is quite different from other late Joseon paintings on the same theme, in terms of its composition. 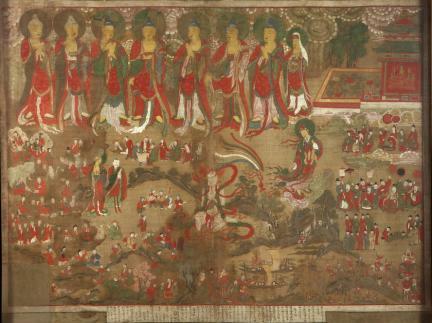 The top tier of the painting features the Seven Buddhas and Avalokitesvara Bodhisattva, the middle tier Ksitigarbha Bodhisattva and Illowang Bosal (Guiding Bodhisattva) and the scene of a death rite showing pretas and monks, and the bottom tier the various scenes in the life of a man and the scene of his death. The most salient aspect which distinguishes this painting from others of its kind is the absence of two indispensable elements in the scene of the death rite; namely, the altar and the officiant. Meanwhile, the pavilion symbolizing the Paradise is placed in the top right of the painting, and the Seven Buddhas are strongly emphasized. Finally, the combat scene is not one of a ground battle, as is customary, but one of a naval battle. There are three other paintings on the theme of the King of Sweet Dew which omit the altar in the scene of the death rite. 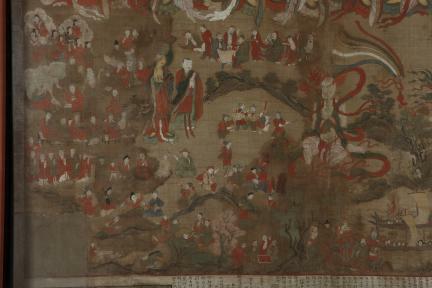 The Painting of the King of Sweet Dew of Jikjisa Temple (1724), the oldest of the three, was painted by the same artists as this one housed in Seongjusa; namely, Seongjing, Segwan, and Inhaeng. 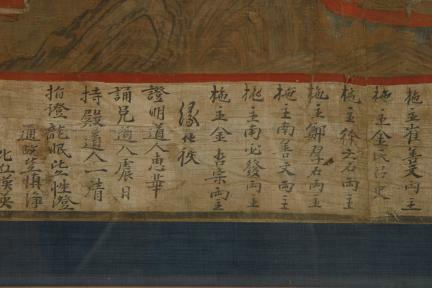 Therefore, the Painting of the King of Sweet Dew of Jikjisa Temple is likely to have been served as the model for the painting on the same theme in Seongjusa Temple. 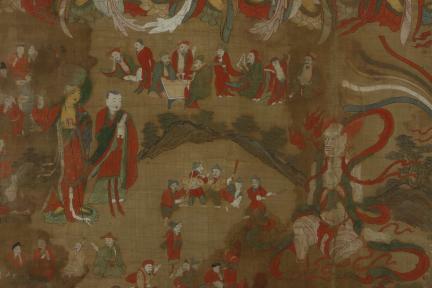 This painting, in harmonious colors and provided with fine details, is noted for its iconographic originality and is deemed invaluable, given especially that the whereabouts of the Painting of the King of Sweet Dew of Jikjisa Temple are currently unknown.